Another number that Gameloft has added to the Thor series is, Thor: The Dark World that has attracted many game spirits. A presentation that has world-class visuals, a nice story telling with an enchanting voice-over, Thor: The Dark World has the potential in it to involve you to an extent, where your role-playing almost takes the shape of reality. The main character in Thor: The Dark World is Loki who has the ambition of achieving the leading power of Asgard. As usual he would be surrounded by competitors and one such rival group is this Marauders. Thor is the one who has taken up the charge with his assistants around him to work for him. The Asgardians are aliens from the Nine Worlds, but Thor too has his team of assistants ready who are no less threatening than the former. They take the shapes of Sif, Hemdall and Warriors Three. The opponent power has NPC fighters in their team along with Norse Warriors and Valkyrie to retort against the cannon fodder in the place named Einherjar. The game keeps in front of you a load of tasks to be done in each level. Unfortunately, the controls to complete these tasks are quite disappointing and hence make your scoreboard go for a random display. There are Melee, Mjolnir and thunder-god Beta Ray Bill, who are quite different in their attack modes and you really cannot predict that well, whether you can win over them. In Thor: The Dark World, you are the fortunate one to meet the thunder-god Beta Ray Bill. There can also be quite relaxing moments where you can just sit and watch the Einherjar facing its invaders. Thor has the power to use some lightening powers, by an upgradation of ISO-8, this can be continued. Thor’s hammer is the next weapon which comes in use very often and all you need to keep it working is upgrading it with a regular currency called Runes. If you are not motivated enough with the regular currency outcomes, ask for Uru the premium one. To unlock the special abilities of each fighter, just keep tapping those buttons and don’t lose your heart, if it still doesn’t work. Fighting isn't the only job you are given to. 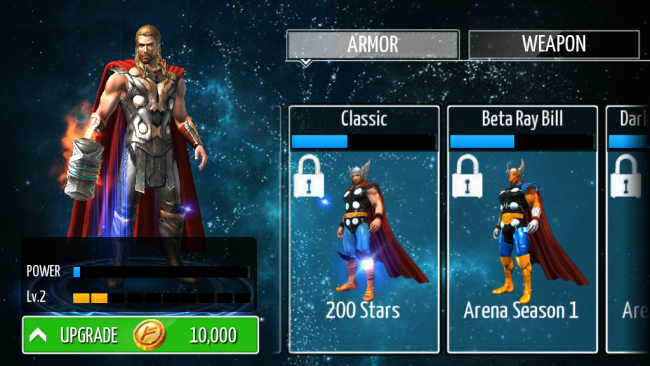 To boost up your fighters, there is a splendid option for you to dress them up with Thor costumes, but they are costly stuff. Earn that much of stars or use up your Uru to access those colourful and impressive get-ups. Thor: The Dark World has both the looks of comic and movie worlds. The graphics, soundtrack and the narration do make you feel flabbergasted. The game hasn’t compromised on the numbers of costumes and hammers, so there your choice has a plenty of scope to play with colours. Thee lightening attacks is a unique feature that spice up the game. Though the controls of the game are disappointing, the total effect of the game has the capacity to make you forget them. The RPG action pack and MOBA elements too need some corrective measures, and with all these falling in place we can hope for a better upgraded version of Thor: The Dark World very soon.